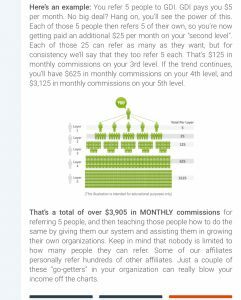 The Sixteen Steps is a duplicatable system that uses GDI Team Elite and other relative income sources to help you create a six figure yearly income. Ask your team leader what step you are on and what you can do to get to the next. It all begins with Vision. Now do you see what I’m talking about! This is called leverage. The Sixteen Steps helps you understand how to create this. Now of course this is hypothetical, but you know with everything if you don’t give up you will eventually find these people who are leaders like you, who love the product and the compensation plan and just stick. The real problem in creating leverage, is being able to help someone do what you are doing. Once you accomplish duplication, your pay and efforts double. When you build a team who can duplicate what you’re doing, you quadruple your earnings and then it begins to build away from you and all it needs is your supervision. You can become very rich very fast if you can create duplication with a good system that’s not scamming people. That’s what the Sixteen Steps are all about. If you take good notes on each of the Sixteen Steps and do them, in a year from now your life ought to be very different. 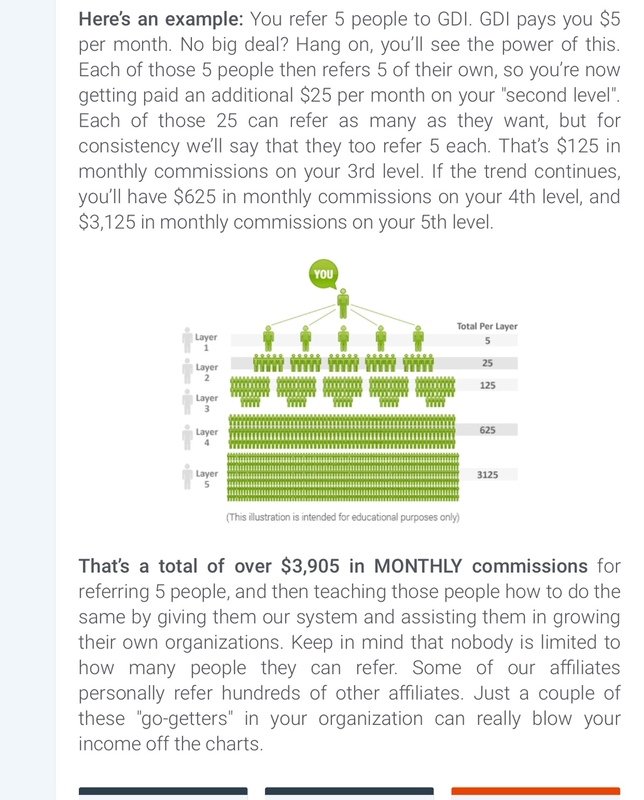 I know that’s sounds crazy but if you trust me you will see how many income streams are built into these steps. Communication is the KEY to our success. This will help us walk through all 10 steps together. Give quality time to communicate with your team leader and your team. Most communication can be done through email but there are times when Skype or Facebook Messenger will help us better. best strategy right now is to show you how to do GDI Team Elite successfully first! Explain a big reason “why” you are doing this business. Make it bigger than just making extra income. If it’s just about extra income, you should be able to find a job that will be far easier to create that. If your “why” does not really effect you emotionally (we like to say if it doesn’t make you cry) then it may not be a big enough reason to motivate you to create the financial leverage that it takes. You will be needing to motivate others to work without seeing an immediate profit and this requires passion and skill. My “why” is that I want to be able to free up my wife from working and so that we can travel the world and take out business with us. So that we are not locked into having to be in any one particular place except that it have an internet connection. I went to be able to have enough money to retire with and give my children currently and later. That dream has helped me weather years of only making a little money here and there until I finally figured out how to make consistent income online. And I will show this to you also. But first take a little time to identify your dream and why to yourself and then me. Make sure you have written down your dream and your “why” so you can use it later to motivate yourself and to help and encourage your team. The GDI Starter Bonus will encourage you to send a pre-made “heads up” email to your friends and family about your business. It’s a super easy but I want to let you know that apart from this, this is NOT GDI Team Elites advertising strategy. We use a simple system that sends out ads across the globe. Go through the 6 emails your team leader send you to get your business set up. Get Your 1000 hits week. If I can show you how to spend 10 minutes a day advertising, would you want to know how? Watch “It’s About Time” Video and go over GDI Compensation Plan. It’s About Time video is entertaining as well as informative. It looks like it was made in the 90’s but it’s ideas are just as relevant today. Check it out here! Oh…I almost forgot…watch it on your computer as I found the video wouldn’t show on my iPhone. Robert Hollis’s course on The Science of Getting Rich. There are five important video’s to begin with. You can start by clicking here. Ask your team leader for details how to watch the following ones. ???? Build your GDI Website with your Team Leaders help. Becoming a team leader with their six members. Duplicating these Nine Steps and continue to complete the Sixteen. 3. Building your advertising. and more.